It...was...RAINING!! Not like a sprinkle but a full downpour. Luckily our local stores provided a Plan B for our disappointed kids. 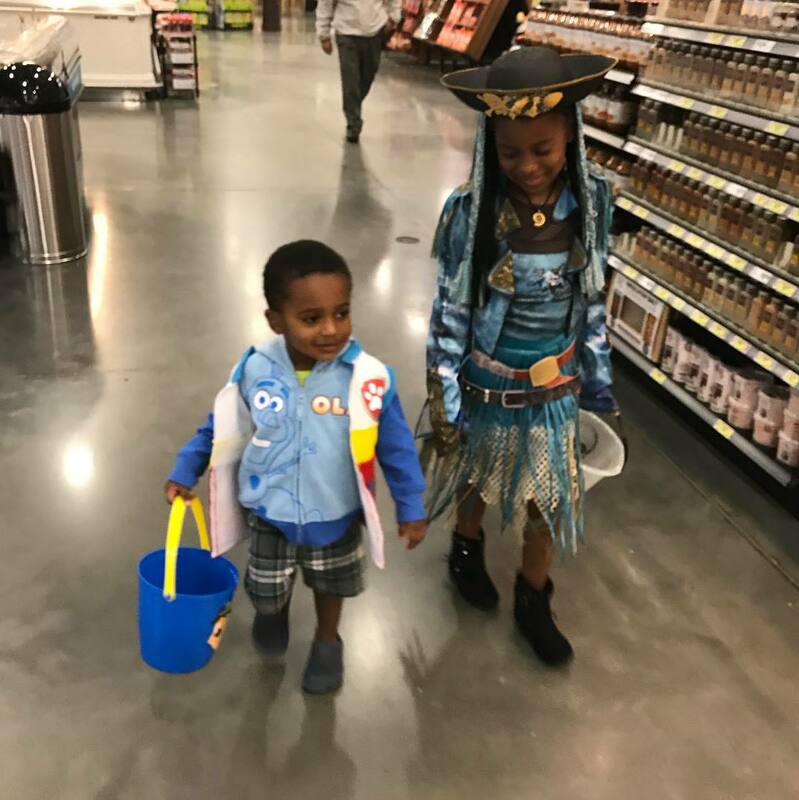 Walgreens had candy for Trick-or-Treaters at checkout while H-E-B had trick-or-treat stations all over the store. It was Prince C's first time really experiencing Halloween and he enjoyed it, even though it was inside a store. Princess A was Uma from Disney Descendants 2 (aka Ursula's daughter). Basically all our favorite Disney fairy tale characters have had kids (who are now teens.) It's really cute, diverse and I enjoy the movies as well. I was supposed to go as Ursula but the rain ruined it for me. Prince C was Ryder from Paw Patrol. I sew Ryder's vest from felt and used my Cricut to make the logo. Ideally he would have had on a plain white shirt and jeans but with the rain, it didn't really matter. We made do with the vest and it was perfectly imperfect. He really enjoyed himself and did I mention he's worn that vest almost everyday since I finished it! On the way home, I let Princess A trick or treat in the rain as it died down a bit. She went to the houses with the lights on while we drove beside. After about 10 houses the rain kicked back up again and she was soaked. Between the 3, she ended up with a bucket of candy plus the 5 I have left over from so few trick-or-treaters that stopped by.